Okay – I have to admit. This news is very bittersweet for me. I was and still am a huge Jay Leno fan and, in a perfect world, I wish there were two Tonight shows. I just was not ready to give up Jay Leno on The Tonight Show and neither, I suspect, was Jay Leno. However, if anyone is ready to seize the reins and win the hearts of America, I believe that Jimmy Fallon is the perfect successor to Jay. Like Jay, he seems like a team player, embedded with a deeply refined work ethic. I can sense this and I think everyone associated with both performers will agree wholeheartedly. I just finished reading Bill Carter’s The War For Late Night. It was a fascinating and extensive read; I came away realizing why Conan O’Brien was the absolute wrong choice back in 2009 and, thinking further back, why Jay Leno won The Tonight Show chair from David Letterman after Johnny Carson retired. The Tonight Show is more than a dream job – it is a responsibility and a privilege. An institution that was established 60 years ago and deserves respect and ongoing commitment from everyone, but especially, the host. Jay learned early on the importance of working with ease and transparency with the affiliates, the producers and the writers and to display flexibility and resilience during turbulent times. During the past few days, the promos for Jimmy Fallon’s debut have been fast and fierce and this is quite normal of course. However, what has impressed me the most are the televised ads with Jimmy interacting with the NBC affiliates – picking up where Jay left off. Those affiliates are key and you need them on your side. Jimmy watched and learned from Jay and I suspect he will work tremendously hard to embrace a wide demographic. But, he will do so by being Jimmy and work at establishing his own identity. I wish him well. I really do. He deserves a shot at this but his longevity will be determined by how far he will go and how hard he will work to keep The Tonight Show in the number one position. And what about Jay? CNN? Possibly. Fox? Less possibly. Whatever he decides to do, he has legions of fans ready to embrace him. But, for now, all eyes will be on Jimmy Fallon. He is starting out strong with a great guest lineup this first week which includes First Lady Michelle Obama, U2, Jerry Seinfeld, Will Smith among others. 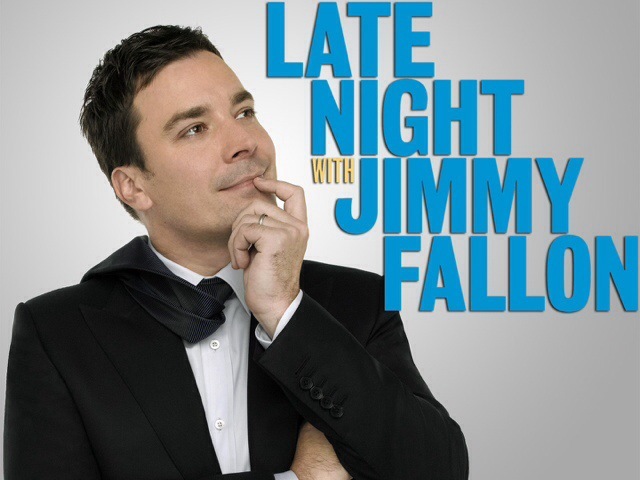 This week, because of the Olympic coverage, The Tonight Show With Jimmy Fallon will air at 12 Midnight on NBC and then return to its regular time at 11:35 PM the following week. How do you feel about the Jay – Jimmy transition?